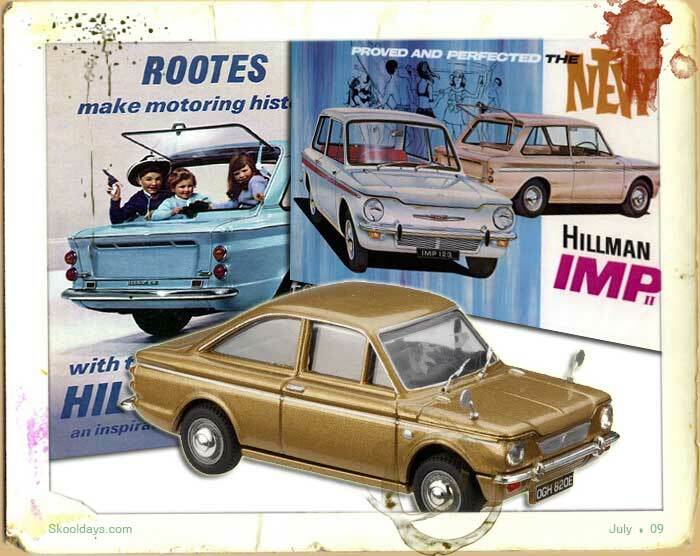 Ah, now the Hillman Imp is a car I’m very fond of as it was among my earliest cars i owned. It was quite unique as it had a rear engine. It was in production from 1963 to 1976. Known internally as the “Apex”, the Imp was intended as a rival to the Mini. A key difference between the two cars was the Imp’s 875 cc all-aluminium power unit.I remember having to put my spark plugs in extremely carefully at the right angle being careful not to shear the heads. Lets face it Aluminium isn’t the hardest metal on earth! The cylinder head was mounted behind the rear wheels, slanted over at 45° to fit. Partly to counteract the over steer handling characteristics of a rear engined design, the Imp had a semi-trailing arm independent rear suspension system – quite sophisticated for a small car at the time. Front suspension was by swinging arms. In 1967 the company had fallen into the hands of Chrysler, to become part of Chrysler Europe, whose stewardship led to the death of the Imp in 1976, after half a million were built and the entire empire collapsed two years later, when it became part of Peugeot.It continued in operation until 2006 manufacturing Peugeot models. The Linwood plant was closed in 1981. This entry was posted in Fashion, Pop Culture and tagged 1960, 1970 by Skooldays. Bookmark the permalink.